In the wake of the loss of Robin Williams I have seen an outpouring of love and sadness, but I have also seen some negative opinions addressing his “cowardice” and “selfishness” for taking his own life. Therefore, I would like to take this opportunity to provide my (different) point-of-view concerning my own personal battle with depression. For my followers out there that don’t know me personally: my father passed away a month before my 12th birthday, which resulted in a time in my life when I felt a darkness so deep, I didn’t think I would ever see light again. I thought things and felt things that were beyond my scope of understanding as I tried to wrap my brain around NEVER seeing my dad again… Life hadn’t yet equipped me with the coping mechanisms needed to “get through” this time gracefully. I felt like I was lost in a rip tide, torn away from everyone and everything I counted on. I was severely depressed for years, but after just a few weeks – my friends were ready to get back to normal. They wanted to talk about boys, sports, and our first year of middle school and all I wanted was for one of them to notice how deeply wounded I was. Essentially, they were ready for me to “move on” and “get over it” (after all, they were just a bunch of 12 year olds too). I began trying to act normal again, overcompensating for the way I felt on the inside with jokes and doing whatever I could to make people laugh – hoping that their laughter would fill the hole inside of me. The more I tried to appear normal in public, the more I broke down in private; going to bed and just hoping upon hope that tomorrow I would wake-up and not feel hopeless anymore. I searched desperately to find interest in the things I used to and to daydream about boys… However, there was really only one fantasy that brought me peace: I imagined (in second-for-second detailed) what it would be like to take my own life. I visualized taking my dad’s old gun in my hands, walking out into the woods behind our house, and ending it all. I imagined looking up at the gnarly contrast of tree against sky as my life slipped into the soil around me. I imagined the painless world of total oblivion. I imagined being reunited with my dad – after all, so many people told me, “your daddy is in Heaven and you’ll see him again one day”. What kept me from following through? I would like to say that I then thought about my mother and how I wouldn’t want to put her through anymore pain or that God came to me in my hour of need and took the thoughts of suicide from my mind, but those would be lies. It was actually my doubt about an afterlife that prevented me from doing it. The truth is the only thing that scared me worse than living in a world without my dad was the fear of death and what comes after it. Eventually, I fought my way through it. My jokes became more genuine and laughter came easier to me. I still use humor to block people out and I still struggle to really open up to others. I will [probably] always have a bit of darkness inside of me – a place that I go to less often as the years pass on, but grief is like a tidal wave and you never know when it’s going to take you away for a little while. The difference in “then” and “now” is that I can see the light when I’m under the waves and I know it will pass. The difference between me, and someone with clinical depression is that I was blessed with a brain that can cope with the darkness. The mind is a complicated beast and I don’t think it’s up to us to call someone “cowardly” or “selfish” when we don’t understand the deepest, darkest, most abysmal nooks and corners of their brain. 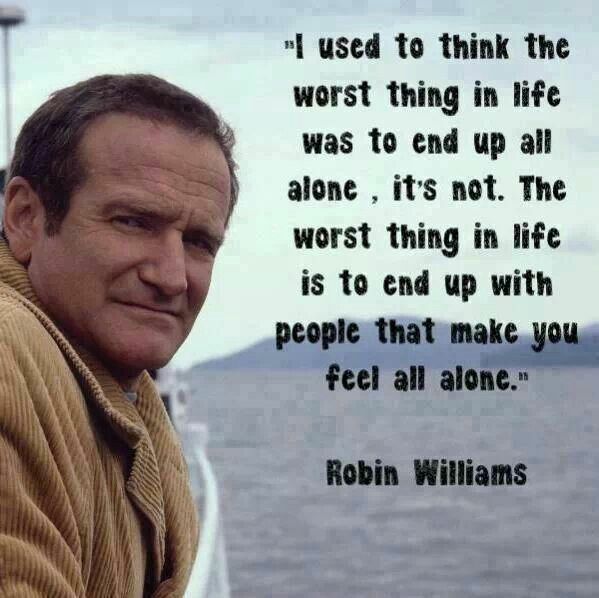 So, if Robin Williams’s comedic genius was a mirror reflecting his darkness within, I can only imagine his suffering. Wow….So powerful and so true….